Cocnut Recipe Collection. Coconut, also known as Nariyal, is a hard fruit that grows in tropical and sub-tropical areas around the world and is widely used in Indian Cuisine, especially south Indian. It can be used in a dried form, paste, grated or even toasted. Not only is it used to make sweet coconut dishes, it is also used as main ingredient in many savory coconut dishes. It is a wide known fact that most of the dishes of the South use coconut in them. From simple dishes like Rava Vada and Rava Bonda, where little coconut is added for flavor enhancing to dishes like Mysore Masala Dosa where the base of the masala is a heavy coconut flavor, every dish gets perked up! Coconut also serves as a base for a variety of curries and dals, the two of the most popular ones being the Mangaloren drumstick curry and Sambar served with rice. The South Indians love their Coconut Rice and Coconut water which is abundantly available. Make your own coconut cream to make curries. Use fresh grated coconut in cabbage stir fry, which is also known as foogath, and as one of the main ingredients in Kadubu which are steamed dumplings with a sweet or savory taste. This goes to show the abundance of coconut recipes! Another cuisine that heavily utilizes coconut is the Maharashtrian cuisine. It can be used as an additional flavor to the already tasty Rava Thalipeeth or as a part of the stuffing and gravy to be stuffed into eggplants in Bharleli Vaangi, a semi dry subzi with other aromatics as well. Tendli Bhaat, a famous rice dish with ivy gourd, is cooked in a rich spice powder with one of the ingredients being nariyal. A similar blend of spices with coconut is also used in making a gravy Green Peas Ambti and can be eaten with Bhakri or parathas. Not only is coconut known for providing a kick of taste to savory food, you can also make great Coconut Dishes like desserts/mithais with it. Traditional Indian sweets like Kopra Pak (kopra means coconut) have rich, really intense flavor of coconut when cooked with milk and also has a really nice texture. On a similar note, there is Nariyal Vadi, made with fresh coconut and sugar with added dry fruits to give you a rich taste. Coconut Ladoo make a great addition to festivities. Coconut is one such ingredient that you can make numerous side dishes with. There is plain Coconut Chutney for all the dosas and idlis, Capsicum Chutney for a hot lunch with rice and ghee, Mysore Chutney to top on potato bhaji and dosas and many other varieties with coconut. Coconut adds to the semi-sweet taste of green peas in the perfect tea-time snack, Ghughras. Another great snack idea is Dhokla with Coconut Sauce. Khatta Dhoklas covered in a rich, creamy coconut sauce is a recipe that is prepared to impress. Apart from the fresh and dried varieties of coconut, international cuisine widely uses Coconut Milk. The Burmese use it to make their famous khowsuey, a thick, creamy gravy and noodles and the Thai use it for the Thai Green Curry, a curry flavored with lemongrass, coconut milk and other spices. Use desiccated coconut to make chocolate coconut dessert. We hope you liked this article on Nariyal/coconut recipes. 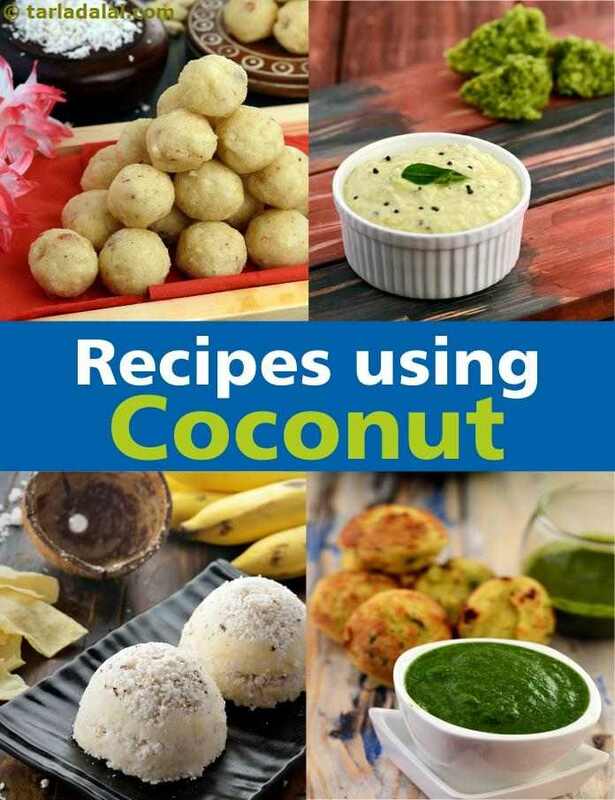 We hope you enjoy our Coconut Recipe Collection, south indian recipe collection given below and would love to hear your comments. An all time favourite accompaniment to be served with south indian delicacy snacks. The combination of onion-green chilli-ginger paste with coconut milk makes paneer in coconut gravy taste like a variety of keralite-stew. It goes well with roti and rice, and is very comforting if served hot, with a generous sprinkling of coriander, on a cold winter’s day! Grated coconut is cooked to perfection with sugar, milk and ghee to make this all time favourite barfi. Be very careful whilst cooking this dessert as even a few extra seconds can cause the barfi to harden up. Appam is served with coconut stew, delicately flavoured with coconut and spices.